BETHESDA, Md. 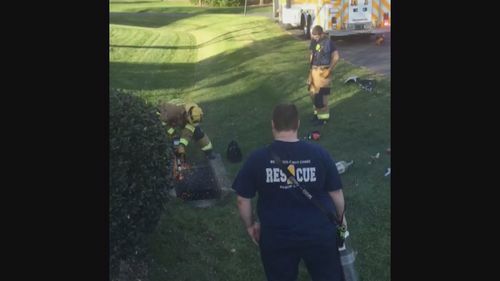 (WUSA9) -- A dog that had been missing for a year and was found stuck in a Bethesda storm drain was rescued by Montgomery County Fire and Rescue crew Friday afternoon, officials said. "Cookie" was stuck in the 7800 block of Lonesome Pine Lane around 2 p.m., Montgomery County Fire and Rescue said. The bars covering the drain had to be removed. Officials said the dog appeared to be in relatively good health and was rescued. The dog had been missing from Kensington since October 2014, according to officials. *We previously reported that this was a K9. We apologize for the mistake.